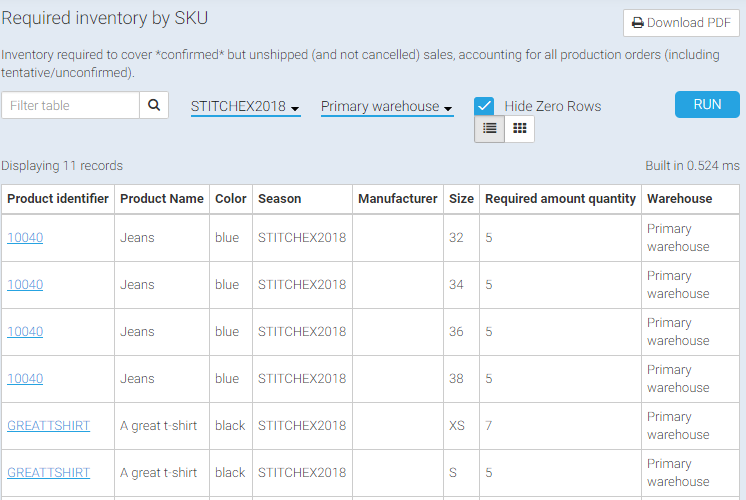 Use the various inventory reports within Stitchex to see how your business is doing. Stitchex reports allow you to see your customers' need for product based on your unfilled orders, your delivery capability (e.g. what is in your inventory) and excess products that are in your inventory but you do not currently have on order. You can also see what products are remaining to ship to your customers. 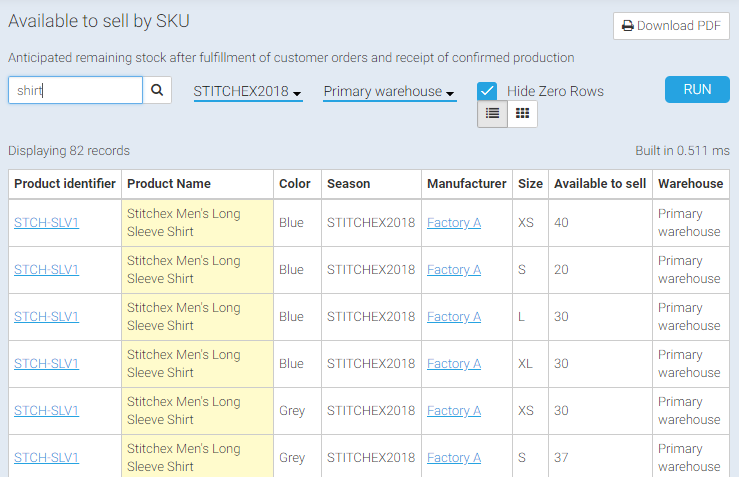 In addition, Stitchex provides inventory reports by product SKU so that you can see what is required inventory to fulfill sales orders, reports to show you what you have in production and what you have available to sell. whether to have a promotional discount or marketing campaign for a particular product in excess. discontinue production of a product that is not selling. whether you need to increase production on a particular item that is popular but you have a backlog of orders unfilled. After clicking "Run", use the "filter table search box" to narrow your selection further (e.g. by product identifier, size, color, order #, manufacturer, etc). The search field capability will be different depending on which report you select and whether you are in summary or detailed report mode described in #5 above. (See Figure 3 for an example of a detailed report searching for manufacturer "Factory A"). Stitchex provides these 9 Inventory Reports. Most of these reports have common fields on them including Product identifier, Product Name, Color, Season, Manufacturer, Size and Warehouse. Seeing a consolidated report with these fields and being able to further refine your criteria with these fields, allows you to generate reports that give you visibility into how you are doing in each of those areas. As an example, you may want to compare Sizes across seasons for a particular product. Or, you may want to see products for a particular Manufacturer by size and color. The Reports that are available each have a unique field other than the fields previously mentioned. Below we will call out any fields that are different or unique to those reports. Current Inventory Levels - Current stock level including unshipped pick & pack. The In Stock field is unique to this report. Inventory Value - Total wholesale value of your current inventory converted to home currency. Unit Price, In stock and Wholesale Value are the fields unique to this report. Required Inventory by SKU - Inventory required to cover *confirmed* but unshipped (and not cancelled) sales, accounting for all production orders (including tentative/unconfirmed). The Required amount quantity is unique to this report. In Production by SKU - All as yet undelivered production (including tentative production orders). The Ordered to receive field is unique to this report. The report is useful to see what production orders you have combined with previous production orders for the same manufacturers and include sizes and styles. Available to Sell by SKU - Anticipated remaining stock after fulfillment of customer orders and receipt of confirmed production. The field Available to sell field is unique to this report. Available to Sell from Stock by SKU - This report shows Stock at hand available to sell (after fulfillment of customer orders). The field unique to this report is ATS from Stock. Combined Inventory by SKU - This report is not available in detailed view as the summary view already provides much detail. The fields unique to this report is the are the In Stock, Required quantity, To Receive, To Ship and Available to sell. You can filter and narrow your search on any one of these fields. Inventory Wholesale Value by SKU - Total wholesale value of your current inventory converted to home currency. Remaining to Ship - The Remaining to Ship report does not have the same fields as all of the other reports. This report shows you what is remaining to ship to your customers. Please note this one report has an additional "filter" option on the top right so that you can filter by customer. It is not available on a detailed view. The summary view already has all of the information you will need including quantities of what was ordered, what is remaining to ship, what has shipped, customer name, order date, order numbers, product sizes, colors and product identifiers. The Current Inventory Levels report shows current inventory levels including quantities added to pick tickets but not yet shipped. The Required Inventory by SKU report shows what additional inventory is needed to cover confirmed customer orders. When you are ready to enter your production phase, it's this data that is used by Stitchex to suggest quantities for your production orders. 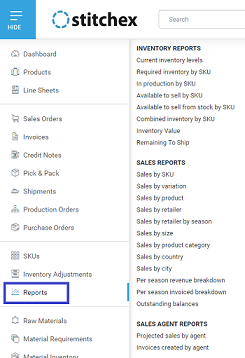 The Available to sell by SKU report shows you excess stock and work in progress (pending receipt of production) that you can sell to customers.